The mission of the Fort Pitt Society of the Daughters of the American Revolution has always been to maintain, preserve, and protect the Fort Pitt Block House. Specifically, according to the deed signed in 1894 between the Fort Pitt Society and Mary Schenley, the Society agreed to “perpetuating the historical associations surrounding [the Block House], improving and suitably maintaining the…ground enclosing and about said ‘Block House,’ preserving archaeological remains, and promoting historical research.” In keeping with the terms of their original agreement, the Fort Pitt Society has strived to promote archaeological research not only within the Block House but throughout its grounds. Various archaeological digs and surveys have been conducted at the Fort Pitt Block House over the past 120 years, most recently in 2003 and 2013. The 2003 dig focused entirely on the interior of the Block House, specifically on the ground levels below the first floor of the building. This project was quite extensive, yielding literally thousands of artifacts from prehistoric eras to the late nineteenth century. The 2013 dig was an archaeological survey of a section of property next to the Block House structure; this piece of property eventually became the site of the Edith Ammon Memorial Garden. This project also resulted in the discovery of thousands of artifacts, providing a glimpse into Pittsburgh’s earliest history. In anticipation of the 250th anniversary of the Fort Pitt Block House, the Fort Pitt Society of the Daughters of the American Revolution planned a memorial garden to be put in the southern portion of the Block House property to commemorate those DAR members who worked tirelessly to preserve and protect the building over the past 120 years. 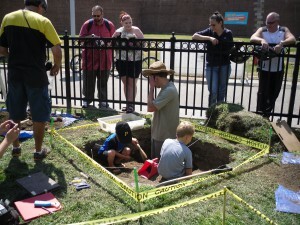 It was decided that in keeping with the mission of the Fort Pitt Society, an archaeological survey of the land that was to be disturbed by the garden installation was required. Christine Davis Consultants (CDC), a team of highly qualified and experienced archaeologists and historians, was hired for the job. This would be the second time CDC had done archaeological work with the Block House site, as they had also completed a survey as part of the 2003 archaeological project. Their new archaeological excavation at the Block House took place from August 15 to August 17, 2013. Over the course of three days, Block House visitors were able to observe as well as join the archaeologist team members as they sifted through the dirt and searched for more information about the history of Pittsburgh’s oldest building. The dig resulted in the discovery and preservation of over 1,000 artifacts. Articles about the dig that appeared in the local media can be found in the News section of this website. 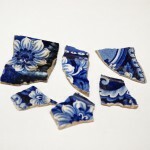 The majority of the items found were remnants from the period when families lived in the Block House during the 1800s. Some of those items included various ceramic, glass, personal items and children’s toys. In addition, multiple artifacts dated to prehistoric times including a bone tool, bear tooth pendant and utilized flakes. CDC discovered a prehistoric stratum of ground that uncovered multiple artifacts dating to the time period prior to European contact in America. Among the twenty-three prehistoric artifacts was a bear tooth pendant, a bone tool, and fire-cracked rock pieces that would have been used by Native Americans. 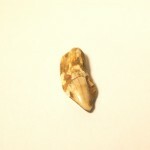 The bear tooth was a piece that may have been worn as a pendant on a necklace. 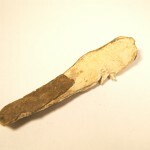 The bone tool could be used to scrape hides in order to tan them. The discovery of artifacts at this level suggests a high probability of other features being found at this level. The prehistoric items found provided more information about the history of Pittsburgh’s Native American inhabitants. The majority of the artifacts dated to the time period that the Fort Pitt Block House was leased to individuals for use as their private residence by Mary Schenley, the owner of the Point District. One item, the Galvin’s Root Beer bottle, is a significant piece. It dates to c. 1892 to 1894 and is marked “GALVIN’S ROOT BEER PITTSBURGH PA.” When a photo of the bottle was published in the newspaper, a relative of Galvin contacted CDC to learn more about her family who still lives in Pittsburgh. Her great grandfather was James Galvin, an Irish immigrant to Pittsburgh and a member of the family that owned Galvin’s Root Beer. He later became a member of the Baseball Hall of Fame. 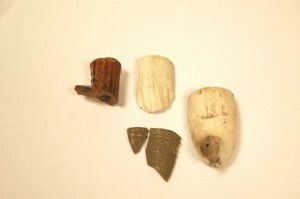 Of the four clay tobacco pipes found, one (on the far right in the photo) had the initials “TD” on it. These types of pipe were common from the late 1700s through the late 1800s. The “TD” initialed pipe uncovered in the archaeological dig at the Block House dates to between 1870 and 1890. The artifacts found in the 2013 archaeological survey provide more evidence that tells us about the lives of those families that resided in the Block House during the nineteenth century. 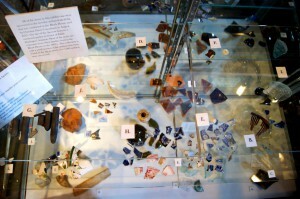 A portion of the artifacts discovered during the 2013 survey is currently on display in the Block House for visitors to see. 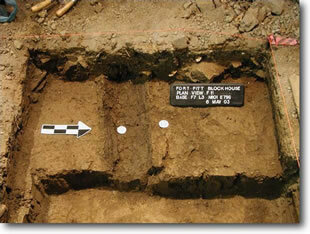 Archaeologists from Michael Baker Jr., Inc. conduct excavations of the lower floor of the Block House in 2003. 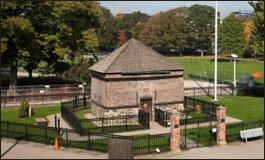 Photo Credit – Michael Baker Jr., Inc.
To ascertain whether there was any evidence to prove/disprove the urban legend that a tunnel had once connected the Block House to the main fort. CUP excavated several one-meter and half-meter units over the five-day period. Testing provided answers to three of the four questions. First, most of the original ground surface and the underlying subsoil matrix within the block house are intact. Found within the soil matrix beneath the historic period zones were several prehistoric artifacts left behind by the original occupants of the Point. Compressed linear patches of bark were identified that may have been used to support a wooden floor. Testing by CUP recovered less than one dozen artifacts that could be connected to the military occupation. These consisted primarily of gun related items such as shot and gunflints. Following CUP’s testing, archaeologists from Christine Davis Consultants, Inc. conducted limited additional testing, focusing mainly on the underlying proto-/prehistoric period deposits. This testing was conducted in units previously established by CUP and clearly demonstrated that Native American cultural remains were preserved below the level of the historic deposits. 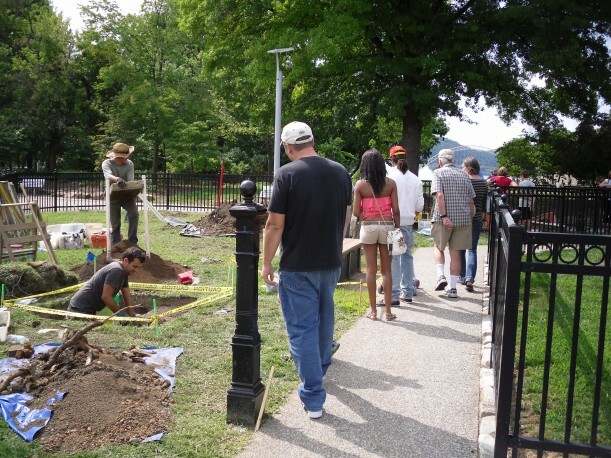 Recognizing the importance of these findings and the need to scientifically excavate the identified deposits, the Fort Pitt Society contracted the Cultural Resources Section of Michael Baker Jr., Inc. (Baker) to conduct a full excavation of the interior of the Block House. Excavations uncovered the decayed remains of the timbers that once supported the floor on the first story of the Block House. The timber and plank floor was covered with a brick floor in the mid 1800s. Photo credit – Michael Baker Jr., Inc. In May 2003, archaeologists from Baker began the full scale excavation of the floor deposits. Excavation work was conducted over a series of both week and weekend days to allow for school children and the general public to visit the excavations. Completed through a combination of paid and volunteer efforts, Baker finished excavation of the entire floor area at the end of the month. 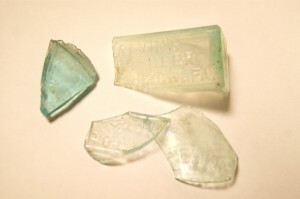 Baker’s archaeological excavations in the Block House yielded 6,769 historic period artifacts, comprised of 2,815 pieces of glass, 2,444 metal artifacts, 387 miscellaneous artifacts and 123 ceramic pieces. Aside from artifacts, excavations revealed that the Block House at one time featured a fireplace. The remains of the fireplace were dated back to the mid-to-late 18th century, the time period in which the Block House became used as a residence. The fireplace was removed during the 1894 restoration and a staircase installed in the same location that enabled visitors to the Block House to access the second story. Excavations also uncovered the remains of the timbers that once supported the floor on the first story of the Block House. Although heavily decayed, the timber locations lined up exactly with those supporting the second story. The timber and plank floor was covered with a brick floor in the mid-1800s when the Block House was used as a residence. The building’s current floor is a little over 1½ feet higher than the original wooden floor. The depression in the center of the floor, which was thought to have been evidence of a tunnel leading to Fort Pitt, was tested to a depth of 6.4 feet with a bucket auger. The feature was determined to have been in-ground storage dug into the floor during the time that the Block House was being used as a residence (1785-1894). The artifacts recovered during all phases of the excavation at the Fort Pitt Block House are currently archived at the Senator John Heinz History Center through a loan with the Fort Pitt Society, and some were included in the History Center’s Clash of Empires Exhibit which travelled from Pittsburgh to the Canadian War Museum in Ottawa and the Smithsonian Institution in Washington, D.C.
All of the bricks used to help restore the Block House in 1894 were from the nearby Isaac Craig House. This house was built in 1785 out of bricks taken from Fort Pitt. Not all of the bricks from the Isaac Craig House were used, and many remain with the collections of the Fort Pitt Society today.